If there is one thing Fearless Records knows, its catchy, upbeat pop-rock that the kids will eat up in big doses. The Maine, Mayday Parade, Artist vs Poet, Sparks The Rescue and Every Avenue are all part of the Fearless family. This review focuses on the latters new album 'Picture Perfect', the follow up to 'Shh... Just Go With It', an album that increased the fans popularity even more and saw the band come over to the UK a few times. Fans who loved the bands last release will love this, as its more of the same hook-filled pop-rock. Tracks like 'Mindset' and 'Tell Me A Wreck' have a pleasant, bouncy tempo. Although there are signs of depth as the title track ('Perfect Picture') makes good use of an electronic effect and shows they are more than your straight up catchy guitar band. It is also worth mentioning that musically the band are strong and do not sound over-produced and David Strauchman's vocals work brilliantly well with the bands style. 'Picture Perfect' as a whole sounds fine but these tracks on their own sound generic. 'Finish What You Started' is rather predictable, whilst 'I Forgive You' follows the same pattern and structure. Throw in the occasional soft track 'The Story Left Untold' and 'Happy The Hard Way' and you're left with 11 sentimental slices of US pop-rock. Overall Every Avenue lean more towards the rock side of things; the bands sound more fuller but the hooks are still in heavy demand, as that is what the band know they can do well. Whether it will continue the bands increase in popularity is an uncertainty but it will please those who have already hooked on to the band. 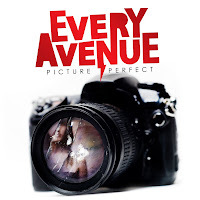 'Picture Perfect' by Every Avenue is available now on Fearless Records.